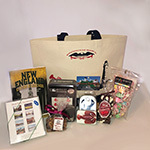 Our sturdy New England tote bag is made of 10 oz natural, unbleached cotton canvas. It measures 10" wide x 12" high x 3" deep and is 100% cotton. 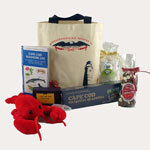 It features navy blue 13" cotton handles and images of the Boston Lighthouse and a New England lobster. Easily stands upright. Made in USA.